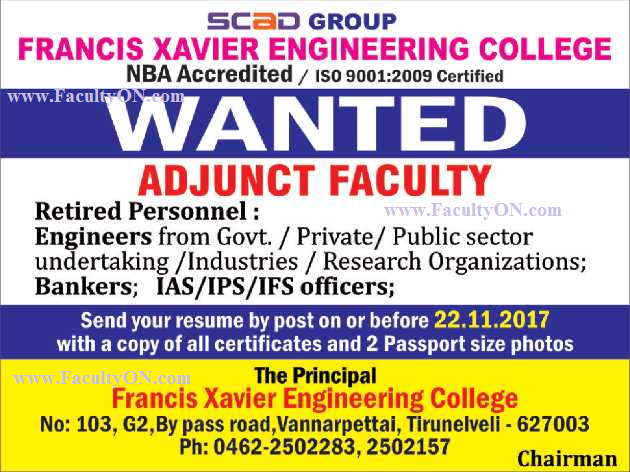 Francis Xavier Engineering College Tirunelveli has advertised in THE HINDU newspaper for the recruitment of Adjunct Faculty jobs vacancies. Interested and eligible job aspirants are requested to apply on or before 22nd November 2017. Check out further more details below. About College: Francis Xavier Engineering College is a premier Engineering College offering Graduate and Post Graduate Programs in Engineering education and MBA, MCA Courses. Situated in the heart of Tirunelveli city, this college aims to provide technical and entrepreneurial skills to the aspiring engineers of tomorrow.